Shenzhen, one of our greatest contemporary urban experiments, faces huge challenges in integrating the non-urban populations on which the city was built, into the city-proper. Premised on exports and experiment, Shenzhen is a city stretched between high expectations and the unintended consequences of constant expansion. Great expectations lie in its DNA; from Deng Xiaoping’s conviction that the creation of Shenzhen in 1979 would spur China’s reform and opening, to his prodding in 1992 that the city not “act as women with bound feet,” to current leader Xi Jinping’s symbolic choice of Shenzhen for his first official visit in December 2012 to signal his reform agenda. Shenzhen did meet expectations, and then some. As one of our greatest contemporary urban experiments, the staggering growth that made Shenzhen synonymous with the rise of “Made in China” must be regarded as much as the result of massive improvisation as of master planning. And today, what started as a city of exception is a site of an ongoing struggle to define the rule. The early decades saw much improvisation to channel a huge labor force into the flow of production within the constraints of China’s restrictive residency system (hukou). Today, rather than securing surplus labor power, the city seeks to “optimize” its labor force in more subtle ways. The changing approach to labor is connected to the delicate negotiation of rural and urban on which China’s rise as a global power ultimately depends. How rural populations will or won’t be integrated into national systems, and what sort of politics can emerge from and through the management of socio-economic diversity, is actively shaping the meaning of citizenship in Shenzhen and China. Here the experience of Shenzhen will be instructive. Within an urban village in Shenzhen. Jonathan Bach. The interplay between urban and rural has driven China’s legendary urban growth: by 2011 253 million migrant workers lived in cities, where average salaries form an irresistible draw at 300% higher than those in the countryside, while the expropriation of rural lands for urban expansion drives real estate markets. Shenzhen’s meteoric rise led the way into China’s urban age. Shenzhen was a product of orchestrated administrative planning and an aspiring managerial class, but its growth would have been impossible without unauthorized migrants working in everything from construction to services to factories. This was a public secret from the beginning. In addition to the (usually unregistered) rural workers who flocked to Shenzhen, the city’s workforce is made up of (mostly lawful) migrants from other cities—millions of technically “temporary” residents. They are, in effect, the embodiment and image of Shenzhen while the true “locals”—the former villagers—make up the smallest group of all, numbering in the tens of thousands in a city hovering somewhere between 12 and 15 million. Mary Ann O’Donnell cites the ratio of migrants to former “local” villagers today at about ten to one within the borders of the original zone (inside the so-called first line), and 30 to one in some of Shenzhen’s outer districts (beyond the so-called second line). This tripartite mix of former villagers, lawful migrants, and unauthorized migrant workers forms the human infrastructure for Shenzhen’s urban improvisations and administrative apparatus. To understand Shenzhen we have to understand how the physical configuration of the city goes along with subject re-configuration. Today the rural and urban fuse in a Moebius strip-like continuum, which began with allowing villages to maintain rural legal status long after the city was created. This effectively embedded hundreds of mini-rural enclaves in the emerging urban fabric, and made them unwittingly central to the city’s trajectory. Caiwuwei village from above. Jonathan Bach. Offloading the burgeoning population to informal housing arrangements was only part of “building the city at no cost.” Another involved granting tax exemptions and free land to ministries from China’s central government to industrialize the countryside. This form of improvisation resulted in a patchwork of at least 24 ministries developing land, intersecting with the parallel patchwork of approximately 200 recognized villages from the pre-Shenzhen era. 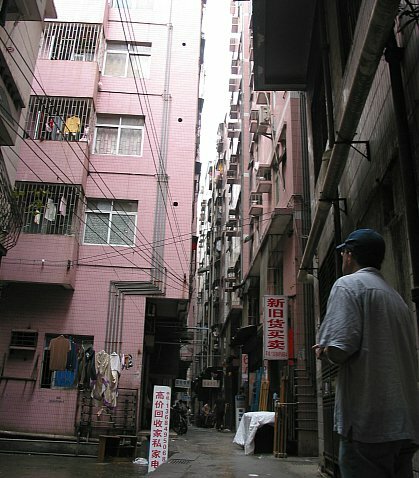 These industrialized areas became the site of Shenzhen’s economic might, while the “villages” became urban enclaves with some of the highest density in the world (or, in the outlying districts, the locus of manufacturing as the center shifted to finance, high tech, and service industries). The result has been an imbrication of the rural and urban in such a way that Shenzhen has come to be defined by the ongoing process of determining who and what is subject to the urban. The rest of this short intervention will explore these modalities of cities and citizenship. Shenzhen is engaged in a long-term project of creating the civilized (wenming) “urban” Shenzhen subject. For the former farmers, this involved forcibly revoking their “rural” residence status and giving them Shenzhen urban residency. 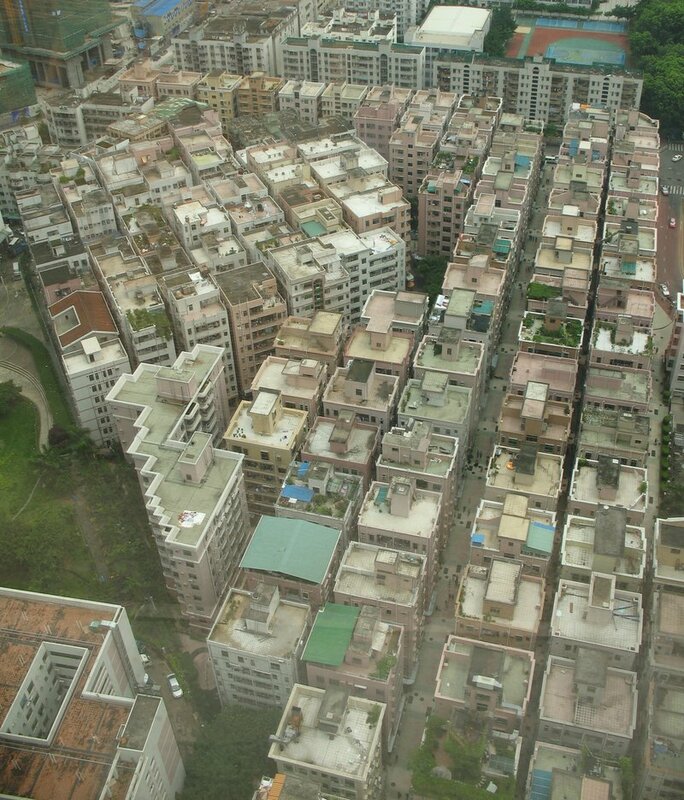 While urban residency is a holy grail for many peasants, in Shenzhen this meant effectively ending their exceptional status that allowed former villages to operate more easily outside the legal purview of the city. The city hopes to force the villagers into the regulated economy and end informal settlements that have, in the official view, outlived their usefulness. Through economic urban citizenship the villagers, as one city official put it, will “come in peasants and leave citizens,” (echoing unwittingly, perhaps, the title of Eugen Weber’s classic book on French modernity, Peasants into Frenchmen). Not only the villagers, but also the migrants who make up the vast bulk of Shenzhen’s population are subjects of new forms of urban citizenship. Of the 12 to 15 million people in Shenzhen, less than a quarter hold permanent residency, approximately six million migrants are unregistered, and the rest hold temporary permits (precise numbers are hard to come by). The city has been experimenting with new forms of incentives to “optimize their population structure” by easing residency requirements for the “right” kind of urbanite—above all degree holders, investors, professionals, and skilled workers, but even “regular” people are incentivized to apply if they accumulate enough “credit points” through a combination of work years, skill level, and insurance and tax payments. While in this way the most desirable migrants are offered formal citizenship in the city (Shenzhen hukou), there is a parallel effort to replace the temporary residence card (which many people simply ignored) with a mandatory internal “Green Card.” This biometric card ostensibly improves access to urban privileges for migrants, who were historically differentiated by their access to city benefits (housing, health care, education, etc. ), and has been touted as a significant step in the reform of the household registry system that manages population flows. Whether or not the new card actually provides any new rights, it stands out as an emerging biopolitical form of population management. The card can be tracked electronically and its data includes marital status, family planning, employment, insurance, criminal, credit, purchase and address records. Together with a massive corollary project of face-recognition enabled CCTV cameras and voice recognition technology, Shenzhen, already the supplier of 60% of all of China’s security products, is developing a state of the art urban surveillance system (financed by an American company) with more than 20,000 integrated cameras, along with police directed centrally by GPS on high resolution maps across the city. Even as such sophisticated technology invites as-yet-unknown forms of subterfuge and re-appropriation, it signals a shift in the how the city seeks control over the flow of labor and links it to the formation of urban citizens. In addition to who is the subject of (and subject to) the urban, Shenzhen is trying to clarify when and how remaining “agricultural” land can become urban. The city led the way in making revenues from land sales the major source of income for local government when “use rights” became a way to marketize state-owned land. The city seeks to buy low by paying small compensation to former collectives and sell high to developers. Yet Shenzhen’s imbrication of rural and urban has resulted in a situation where rural residents still live on 42% of the little remaining available land that the city is able—and eager—to develop. Only a quarter of these residents own legal title, which complicates the process of state acquisition and resale even more. In the latest and boldest of a series of attempts to gain control over formerly (and formally) rural lands, primarily on the outskirts, rural collectives as of 2013 will be able to sell on the open market and keep up to 50% of the revenue. These dual processes of creating new subjects and using market alchemy to turn rural land into urban development is propelled by a tension between Shenzhen’s rural roots and urban identity. Yet this tension is less about differences between country and city folk (real though they may be) than about how the flow of labor can be managed in new ways. Shenzhen is again at the vanguard, this time of a shift from the enclosure, so to speak, of workers in inflexible residency classifications to the modulation of workers through differential forms of access to urban rights, where rights refers to both virtues and prerogatives. While the old improvisations of the urban villages as sites for quasi-legal migrant housing are decreasingly central to Shenzhen’s urban form, the new challenges of modulating urban citizenship will spark no less improvisation in the years to come.